Thanks for visiting our website! At Asbury Memorial UMC we welcome everyone to come and join us as we are "living to God, and bringing others to do so." We'd love to have you join us at any of the various events that happen each week at our church. If you have questions about our church please feel free to call the church office anytime (828-253-0765) and we will get back with you as soon as possible. We look forward to seeing you this Sunday at historic Asbury Memorial UMC! May the peace of Christ be with you. 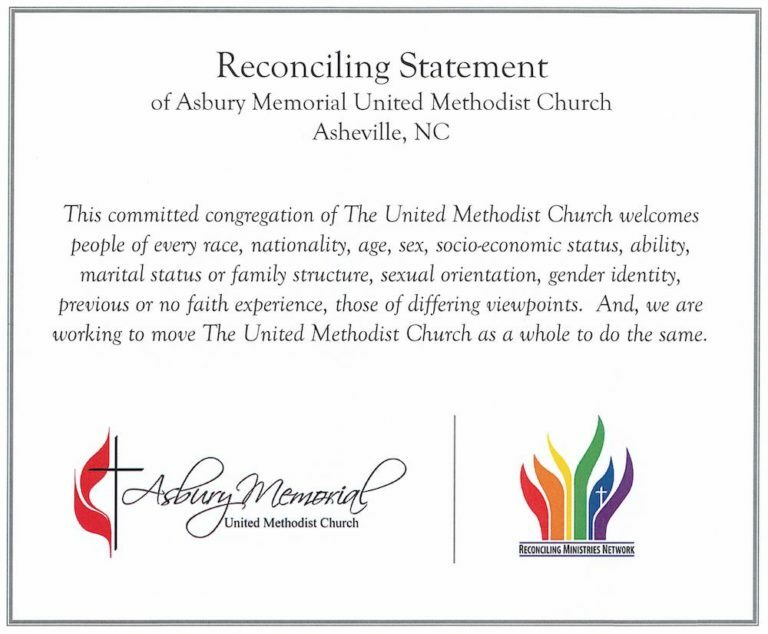 We are currently in the process of working towards becoming a member congregation of The Reconciling Ministries Network of The United Methodist Church. The graphic above is the working draft of our "Reconciling Statement." The Church Council will be meeting on Sunday, April 28th immediately following worship to vote on approving this statement. The graphic is included here in order that everyone can see it before the meeting.